Russia and Turkey appeared Monday to avert a potential crisis in Syria’s rebel-held Idlib province, announcing they would establish a “demilitarized zone” to separate rebels from Syrian government troops and head off an all-out battle. The announcement, at a joint news conference with Russian President Vladimir Putin and his Turkish counterpart, Recep Tayyip Erdogan, comes after weeks of speculation that an offensive on Syria’s last major opposition enclave would prompt a full-scale humanitarian disaster. Idlib, in northwest Syria, borders Turkey and is home to thousands of rebel fighters and about 3 million civilians, the United Nations says. Aid organizations said they feared an assault by Syrian and Russian forces could cause widespread carnage and displace tens of thousands of people. The precise details of the agreement between Turkey and Russia were not publicly spelled out Monday. But Putin said that a zone nine miles to 12 miles long would be carved out ahead of an Oct. 15 deadline. The zone, both leaders said, would be purged of heavy weapons and more extreme elements of the insurgency, including al-Qaeda-linked militants. It would be also be patrolled by Turkish and Russian forces. Hundreds of thousands of Syrians have been killed since an uprising began there in 2011, fracturing the country and drawing in world powers. Russia, an ally of Syrian President Bashar al-Assad, has helped quell the rebellion. Turkey, in turn, has backed elements of the opposition. Putin said the plan announced Monday had the support of the Syrian government. 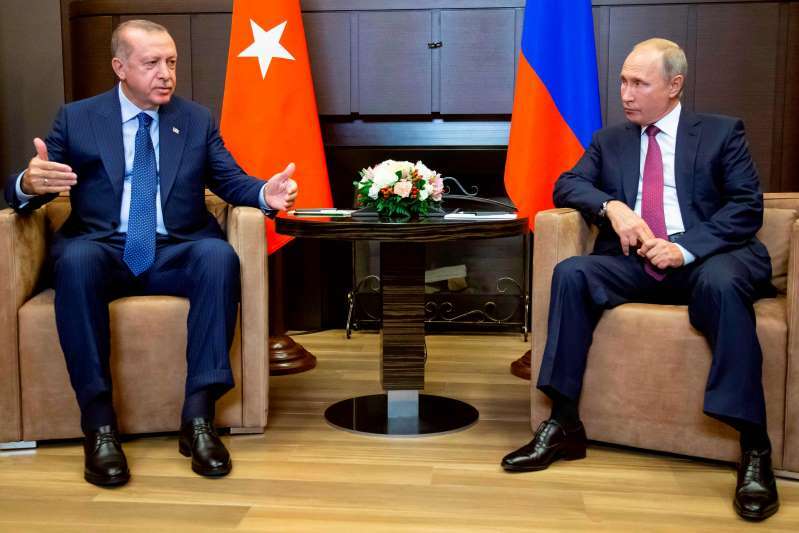 “The territory controlled by the Syrian opposition must be demilitarized,” Erdogan told reporters in the Russian town of Sochi, where the two leaders met. “But together with Russia, we will put our efforts into clearing those territories of radical elements,” he said. Idlib is strategically important for both Russia and Turkey. The former wants to eliminate Syria's opposition, help the government retake territory and convince European and other powers to help reconstruct the country. The latter needs a foothold in Syria to ensure its place at the negotiating table, as the U.N. and Syria's allies decide the country's future. Turkey also wants to prevent a destabilizing influx of refugees into its territory, especially the introduction of militants. Still, it was unclear how Turkey and Russia would persuade rebel fighters to retreat and give up their heavy weaponry. Syria's rebels despise Russia for its support for Assad, who has been in power since his father, Hafez al-Assad, died in 2000. The plan also seems to require that Turkey make efforts to eliminate or isolate hard-core Islamist militants. Beginning last year, Turkey deployed troops and military equipment to Idlib, which had been designated one of several “de-escalation zones” by Russia, Iran and Turkey. The other three zones have since been retaken by Syrian government forces. But Turkey, which maintains 12 observation posts in Idlib, has avoided a direct confrontation with the extremists, many of which belong to a former al-Qaeda affiliate, Hayat Tahrir al-Sham. Turkey has instead created an alternative umbrella organization — the National Liberation Front — for rebel fighters in the enclave. Turkish officials hope to peel away some of the rank-and-file jihadists to join the more moderate NLF, analysts say. “A head-on attack against [Hayat Tahrir al-Sham] now or later would likely destabilize northwest [Syria], prompt a bloody and maybe inconclusive fight, and potentially set off retaliatory attacks inside Turkey,” said Sam Heller, a senior analyst on non-state armed groups at the International Crisis Group in Brussels. “This is why the Turks are pushing so hard for something that approximates the status quo,” he said, adding that Turkey might give “safe exit” to some of the more hard-core radicals. “They’re in an extremely difficult position," he said. But even as Turkey appeared to be boxed in, some analysts said that Erdogan had in fact been bolstered by support from Europe and the United States. Europe, which also fears another migration crisis, joined the Trump administration in pledging a harsh response to the use of chemical weapons by government forces in Idlib. The United States recently walked back an announcement that it would withdraw troops from Syria before the end of the year. Instead, U.S. forces will remain to push back against Iran in Syria, the State Department's new Syria envoy, James Jeffrey, said this month. Zakaria Zakaria in Istanbul and Louisa Loveluck in Beirut contributed reporting.